This massive new update adds a 30-hour story, overhauled systems, portals enabling quick-travel and lots, lots more. We’ve spent that year working hard on free updates. 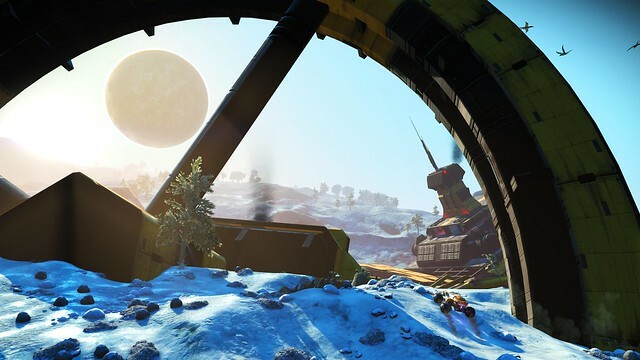 Update 1.3, releasing today, is our biggest to date and will be available for free to all No Man’s Sky players. Read on to learn a bit more about what you can expect to discover in the latest update — a lot has changed in a year! Our story gives a new context, quest system and branching narrative to No Man’s Sky. 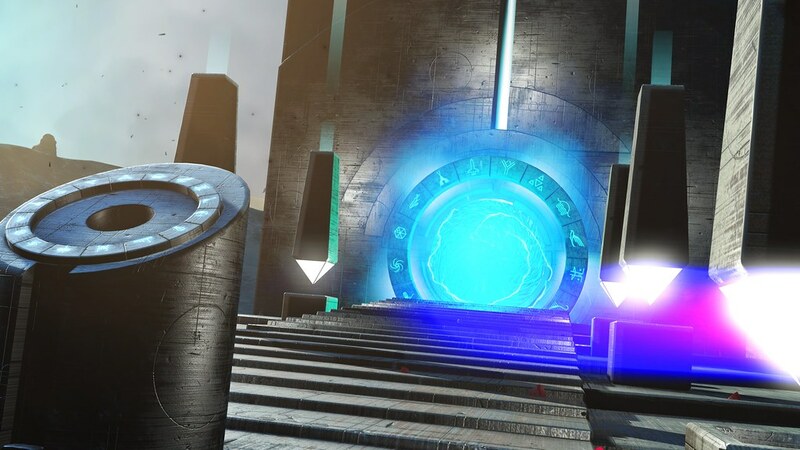 In the Atlas Rises story, the fabric of existence is starting to falter. A mysterious new interdimensional race have appeared, and ancient portals have begun to open. Glitches in the simulation, visualised by strange floating orbs, allow players to see and communicate with up to 16 other travellers and explore the universe together. We hope you enjoy this and what follows – look forward to seeing you out there! At last! The game’s getting better and better. I was just discussing with a friend yesterday all the changes and improvements to the game since it launched, and how i needed to play, since i haven’t since the last patch. I think this weekend will be a good time to fire it up and check it all out on my brand new PS4 Pro! Looking forward to it. I’m beyond thrilled reading this!! I’ve been diving back in a lot lately, but I felt like it was missing something. This could fix that! Im glad the community has tightened up and the devs are still working hard for us Thank you! 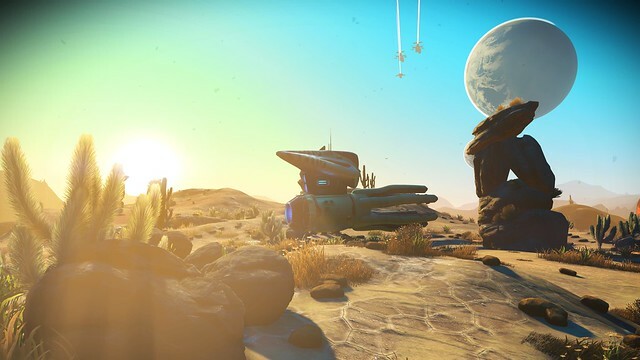 It’s really great to see you guys continuing improving the game and to see that there is a dedication to keep working on it, to make a real one of a kind video game, I understand the immeasurable work it must be to make sure everything is working and keeps getting better and even though I don’t play No man’s sky as much as I once did, with every update I get back and remember why I like it so much, keep up the good work. I have a feeling I’ll be able to convince some friends to get into it as the updates keep building your vision! This is a MASSIVE update! Thank you Sean & co.! I’m very excited to play this latest update, I can’t believe it’s already been an amazing year of exploration! So glad to see the game continue to grow and evolve, and to watch a passionate fanbase emerge. Thanks for delivering on your promises, and keeping this amazing game relevant. It’s really an all time favorite for me now, a zen experience of stepping inside an Issac Asimov novel that I hoped for so much. Thanks a lot No Man’s Sky team. You’ve really done a ‘reversal from the rock’ and a hard place position you were in last year. Respect. That’s a huge amount of content :) all the trolls and naysayers are diminishing bit by bit, leaving day 1 players and new fans to enjoy these updates and experience what was promised and more. Adding No Man’s Sky to “To Buy” list. Thanks for the update as I’ve had this game in mind for awhile. Well, the game is really cheap so …….sure why not. This explains why No Man’s Sky is on sale, on PSN. Wow, what a fantastic update! Got the Platinum a while ago but it looks like I am downloading No Man’s Sky again! Thanks for all your hard work. Don’t stop now and keep it up. Hopefully this new interdenominational alien race is some new sinister enemy that we have to fight. If not we need this ASAP! Thank you for turning this into something that is actually worth checking out and thanks for the year’s worth of excruciating hard work. Wow! This is the perfect excuse to finally try this game. I know it’s been a bumpy road, but I’m glad you guys are continuing to support and expand this unique IP. Thank you. Sean, you and your team have done phenomenal and very impressive work with this game! Huge props and thanks. You guys are easily one of the most talented teams out there in game development. This is awesome content. Each update has been fantastic. Keep it up!! It’s funny this popped up for me today. I was actually thinking about playing this this weekend. I actually put a lot of time I to the initial release and enjoyed it. The free updates have only made it better and gives me a reason to come back. I loved the game for the first couple months after release, then ran out of steam and sold it because Hello Games was radio silent for so long. After reading this update (and following along throughout), I’ve decided to jump back in with the digital purchase. Looking forward to re-discovering the game! We need a FOV option, badly. This is pretty awesome! I’ve been looking to get back into NMS. This sounds like the time to do it! Thank you for continuing your work even with all the hate you receive. Yeah they pretty much have been pooped at by those ****ed off players. In my case I have always loved the game because I never expected too much. I know games as ambitious as NMS will take a long time to perfect but Sony pushed its release. Hello Games’ efforts to fulfill their vision of NMS despite the ****storm has been really awesome. Love the game! It’s getting better all the time! i can see this game being added to the IGC and then becoming huge. can you imagine the amount of players you will then get to playing it? look at how successful rocket league is because of that approach. Nooo!! My base! It was moved to a completely different planet! I had a great planet. It was snowy, now it’s a desert with high radiation levels… ahh I hate when stuff like this happens. I appreciate the update I just wish it didn’t move my base. Looks amazing. Re-downloading now. I was following and playing for awhile but honestly got bored. I do hope this new update sparks my interest. I really did like this game and I believe that Sony should of backed your project a bit more since it was a very hyped game. Sean, you did make a mistake over hyping the game but I am glad that you and your team keep releasing free updates to make up for it. I do hope to play soon and hooe that I can get back into the NMS community. I’ve had the game since launch day and I do admit I fell off of it after about twenty hours as it was getting monotonous. I just grabbed the digital version as I want to head back in, and I play games far more often if they’re already on the hard drive. Can’t wait to see all the new changes as the game has had a MAJOR facelift over the course of the last twelve months. Massive Respect that you guys worked this out after all the negativity. Though, some of the install base may have sold the game for far lower price to recoup after their disappointment. Those users may not be willing to re-purchase the game. No trophies for this update? Hope to see some. Awesome update. It’s pretty nice to see such a positive comment section too. So was the whole thing about finding other players in the launch game a straight lie then? Because from this it sounds like something they haven’t even figured out HOW to do yet. I asked Sony for a refund for this game and they banned me from the live chat. Horrible customer service and no respect for a customer who has spent thousands on their network and their hardware. Thank you sean and co. for this wonderful update! by far this is one of if not the best game on ps4. keep up the great patches! Thank you Hello Games. Keep doing what you do and NMS will be what you, Sean and team, have always wanted it to be. We will be here to support and appreciate your efforts. Now I’m off to the Galactic Hub. Already sold my special edition but maybe I’ll buy it again digitally, this patch looks interesting. Is the resource management still brutal like in the launch game? I remember even the act of collecting resource need resource (for the gun). I was super exited about this update. Then my base is broken (3rd story structure has no floors). All of my named discoveries disappeared. Needs a patch to fix. Each update continues to improve upon the game and get us closer to the original concept. I enjoyed the game, but was disappointed that portals did not work, there were no giant creatures like sand worms, the lore didn’t lead anywhere, and that it actually wasn’t possible to meet another player. Keep shooting for the stars, Hello Games! I just want my money back! You have used it to fix the game. Find it ammusing that you make sure to tell everyone these are ‘free’ updates. Too right they are free, your fixing the game. Even under pressure you were clearly still 12-18 months away from developing the game advertised. The dev team size against the games scope was massively unrealistic. But you blew a load of smoke right till the end and we know what happened… Really wish I researched the dev of this game before sinking £50 into it (Joe Danger and…..?) Its £20 game with expansion packs to purchase. Thats how you should of sold it. Look at the amazing Hellblade and its only £25! Give it a few months and pay content will start to come out. All that stolen money they would not refund will be drying up and they cannot keep doing it for ‘free’. Few more months and they will have to move on to a new project if they javent already to keep themselves viable. So disappointed with this developer and Sony for its part too. Love gaming but this has been a real let down in so many ways. This update has me excited to jump back in to No Man’s Sky. I enjoyed my time with it when it first came out but ultimately put it down when I realized how far I was from the center and felt like the planets I was coming to were feeling very similar. I am especially interested in seeing what the story and lore that has been added is like. Plus I was getting near to earning the platinum trophy and would love to have that. I don’t have many and this would certainly be one I would be proud of. Thank you Sean and everyone at Hello Games for continuing to support and improve this game. I wish you all nothing but the best. One of my favorite memories from Playstation Experience in Vegas will always be getting to hear 65daysofstatic perform for the “Night Under No Man’s Sky” event. Splatscreen co-op On the update? Hmmmm….I might have to buy this again. I always had hope for this game and appreciate your dedication to it. Here’s hoping you continue working on it. Has anyone had the game CDT with the new patch? Game freezes/CDT at opening scene. Tried uninstall/reinstall, no luck!! Other games work but not NMS. I have a PS4 Pro… thoughts? ?